On this page you'll find bath soaps scented with fruit scents or citrus. Most are cocoa butter-based soaps and one, the always popular Orange Blossom, is a shea butter bath soap. All of them will give you abundant, creamy lather. Have you ever had Blackberry Sage tea? This is a lovely complex berry scent with an herbal undertone. 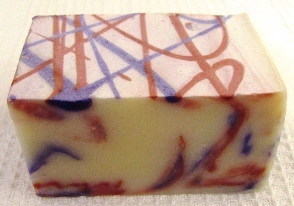 A pretty soap, two-toned in two ways: layers of colors and scented with peach fragrance and Black Keemun Tea. A new offering, honey-fragranced cocoa butter bath soap with a honeycomb surface. Fruity and fun, summery and tropical.